The Erving Goffman Memorial Lecture is being held today as part of the year-long celebrations of the 50th anniversary of the Sociology department at University of Edinburgh. 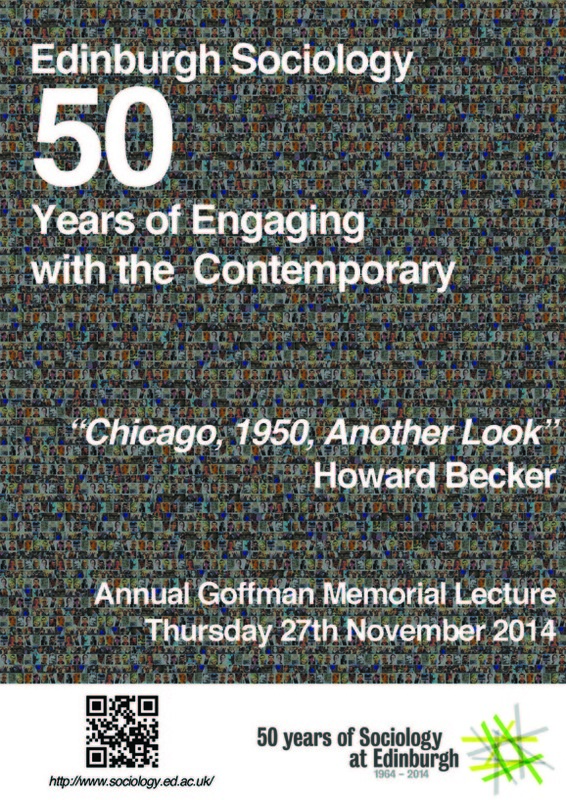 Today’s lecture is titled ‘Chicago, 1950, Another Look’ and will be delivered by the eminent Professor Howard Becker. This will look at Becker and Goffman’s time at the University of Chicago Department of Sociology in the late 1940s and early 50s, which is now seen by some as the birthplace of something called “The Second Chicago School”. The University Library holds a wide range of material on the Chicago School of Sociology, works by or about Goffman and, highlighting Professor Becker’s wide range of academic and personal interests, a number of books written or edited by him on a varied selection of subjects. So if you are unable to attend the Lecture or just wish to find out a bit more then read on. Online material, such as e-books and e-journal articles, are only available to staff and students at University of Edinburgh. Books on the Chicago School of Sociology. Books on the history of the Chicago School of Sociology. Books by Professor Howard Becker. Just a few examples of articles written by Professor Becker referencing Goffman. (University of Edinburgh staff and students only). Use the Library Catalogue or Searcher to look for more books or articles on these subjects or people. Searcher is only available to students and staff at University of Edinburgh. This entry was posted in 50 Years of Sociology at Edinburgh, Goffman Memorial Lecture and tagged books, Erving Goffman, Howard S Becker, library, Social & Political Sciences, sociology by spslibrarian. Bookmark the permalink.